I have been a fan of Tyranny of Hours since first hearing and seeing the band live near Portland, Oregon, some years ago. I reviewed and enjoyed their self-titled debut album and now the band is back with the long awaited follow up Darkling, scheduled for release mid-June. For this release core members guitarist Don Graham and vocalist Michelle Mattair are joined by new full time members, bassist Matt Galligan and Alex McDonald on drums. Darkling picks up immediately where the debut left off, with pounding drums and revving guitars. River of Stones roars to life with duelling guitars from Matt and Don with excellent, well placed orchestrated keys and surrounding percussion sounds. Power to the max, as Michelle says, “Start off strong – then slay henceforth!”, or sings, “In your mind there’s still time to seize the day!” Michelle’s voice towers above the grinding guitars and thumping drums as rivers of sound invade your ears. A fantastic opener, I’m ready for more. Oceandead is the first single, released with an accompanying video, and is one of the best songs on the album. Filled with great guitar solos and duets, Don takes the lead on the main guitar solo, trading with Matt throughout the track. Michelle sings, “How I long for my cold Northern climes. Oh I ache for the solace of wintering pines”. Dreams of winter with the song’s title repeated for emphasis – Goth on fire! Waited is another favourite, Michelle opening on vocals with acoustic guitar and wind sounds from the fall surrounding her; “Someone told me not to wait. So, I staked my claim at the Autumn Gate”. You can feel the season in the air for sure. The keys on this track are perfect, like the great mixes Dream Theater employed with Kevin Moore on their earliest and best albums. Matt gets the main solo on this track, again alternating with Don throughout. Unwired opens with flute orchestration and powerful Mike Portnoy–like drums; Alex must have studied the master’s technique because this almost sounds as good as Images and Words. Then, a cool surprise, an almost Nirvana Heart-Shaped Box lyrical twist; “Wait. Stay. Mean – nothing words you give away”. It almost sounds like the same lyrical cadence for, “Wait, I’ve got a new complaint…”. Nice. I’m sure they’ll deny it, but I love the fact it might have even a tiny bit of homage in it – Northwest bands celebrating Northwest heritage. In contrast, Night Becomes Light opens quietly, which is a nice break after all the gunning guitars and pounding drum openings, but soon they are back at it. The orchestration and keys help to create a wonderful soundscape and the bass work is outstanding here. Michelle holds a note, “As children remember in dreams we flyyyyyy…”, then, “I long for believing, but the voices tell different stories”. Don rips out the first solo, followed by Matt on the second, the duelling guitarists providing lightning at night. The title track is another wonderful mix of the band’s talent, opening with an almost sitar-sounding acoustic solo from Matt that is original and memorable. On this track, Michelle gives you the full range of her vocal talent, from quiet, to normal, to the full-on scream. The machine-gunning drum and guitar blitzkrieg is another highlight, raw talent in action. The King’s Mirror ignites as the arsenal gets emptied fast. The drumming is all over the place, like it is crawling through your mind, upside down and sideways. Very cool. The line “Reverie – the curse of the serpentine mind” takes me back to early Edenbridge albums, as does the power of Michelle’s vocals. This is the longest song on the album, at over 9 minutes, a sharp track full of great orchestration and more duelling guitar solos than we deserve. Both tracks are firm favourites. Buzzing guitars open Tapestry, revving drums and orchestration joining in. Michelle, sounding a lot like Heart’s Anne Wilson sings, “In days gone you felt one in harmony with Dia Griene. The tears are run dry… Fight, fight, come together the cold light and make it your own”. Similarly Cerulean Moons is another wonderful showcase for Mattair’s vocal ability, opening with great spacey orchestration, Dream Theater–like keys with Portnoy-esque drumming. Michelle sings, so beautifully, “Where is the joy of a heart in the hating. Dying a life where all of your wonder is gone”. The protruding bass sounds fantastic and the duelling guitar solos are wonderful. 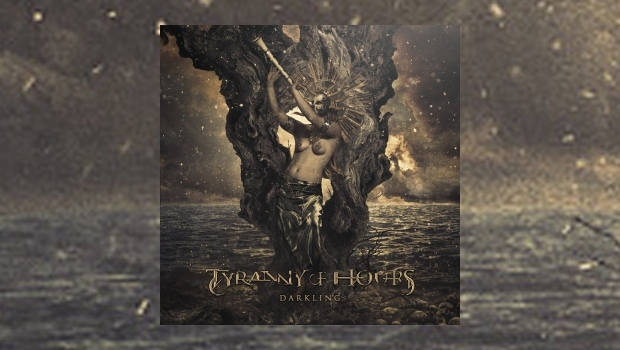 Darkling is a great mix between the powerful lyrical content and wonder exuded by Edenbridge, my favourite female-lead heavy metal band, and Sirenia, at its peak with Ailyn Giménezon on Perils of the Deep Blue. Get this album and glimpse the future of heavy metal, while you enjoy some highlights from the best of the past. It is well worth your time to enjoy the effort that this Northwest band have put into the music. Let them tyrannise your hours with Darkling.